We’ve shown a lot of love to Dark Horse’s ever-growing Neil Gaiman library, from Toussaint Egan’s glowing review of How to Talk to Girls at Parties to the exclusive announcement of A Study in Emerald and a clown-colored look at Harlequin Valentine. Next Wednesday, one of the master storyteller’s comic-book deep cuts gets a handsome new hardcover release from Dark Horse Comics: Only the End of the World Again, scripted by longtime Gaiman collaborator P. Craig Russell, illustrated by Troy Nixey and colored for the collection by Matt Hollingsworth. First published as a serial at Oni Press in the late ‘90s, Only the End of the World Again pays tribute to H. P. Lovecraft and Roger Zelazny with a tale of a claims adjuster who sets up shop in Innsmouth, Massachusetts, only to discover a prophecy that a werewolf may bring about the end of the world. Oh, and the claims adjuster just so happens to be a werewolf. 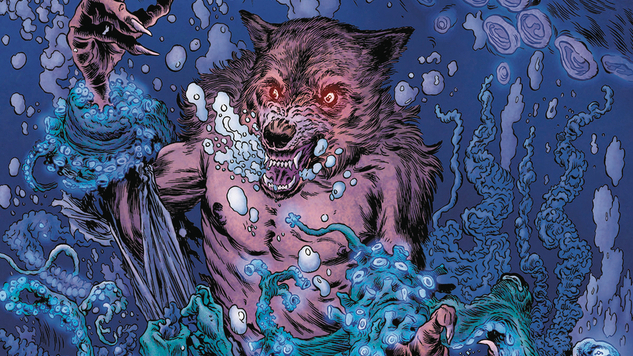 Check out an exclusive preview of Only the End of the World Again below, and visit comic shops next week to experience the lycanthropic apocalypse yourself.